I know we’re still in Christmas mode, and it’s not even 2012 yet, but preparations for the next installment of #whampgather have been underway for some time.What’s #whampgather? I suggest you read the FAQs! Once again, I’m raising the bar. Alongside the usual delights of the raffle, a DJ, and a hundred or so locals all up for having a spectacularly good time… to blow away the New Year blues this January 12th, we’re going to have live music courtesy of the Dave Mitchell Blues Band. Don’t say I don’t do anything for you. Regulars at The Priory Tavern, which is once again hosting whampgather, will know the band – they’re members of 12 Bar Blues, which plays the Tavern regularly. Very kindly, Dave and the band have agreed to do the gig for free as we’ll once again be raising money for The Winchester Project – a local youth charity that we’ve supported for the past couple of years. 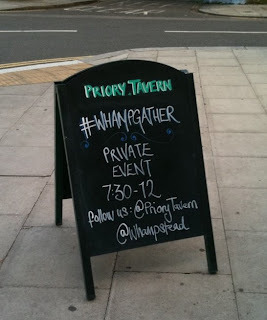 Whampgather is still free to attend, although I hope you will all be generous in your raffle ticket purchases. Back in September we raised £350 for The Winch and I’d love to get that nearer to £500 this time around. There’ll be the usual selection of excellent local prizes – I actually lost count of how many we gave away last time, but there were at least four meals for two at local restaurants, a bottle of champagne, stacks of music, local books, tickets to comedy at The Good Ship and more. Here’s where you need to pay attention. You will need a ticket. September’s whampgather sold out faster than Take That’s comeback tour. Places are limited to the pub’s maximum capacity of 120 – last time they were snapped up in less than 24 hours and the waiting list stretched to 60. It is worth being on the waiting list – people do drop out (and then tweet to say they regretted it), so if you’re too slow for a ticket then I’d recommend adding your name anyway. Tom has a Moment How did you do?